Our single-sided work platforms have been load tested in 2018 by a UK specialist lifting equipment testing & design company who are members of the Lifting Equipment Engineers Association. They were tested to a max. load of 450 KG evenly distributed on the platform applied using calibrated test weights. As far as we are aware, no other manufacturer tests to these vigorous standards. What is the purpose of a Single Sided Work Platform? A Single Sided Work Platform is a movable elevated stage that workers use to stand on while performing chores that require accessing materials, products and other items located at higher levels or hard to reach areas. 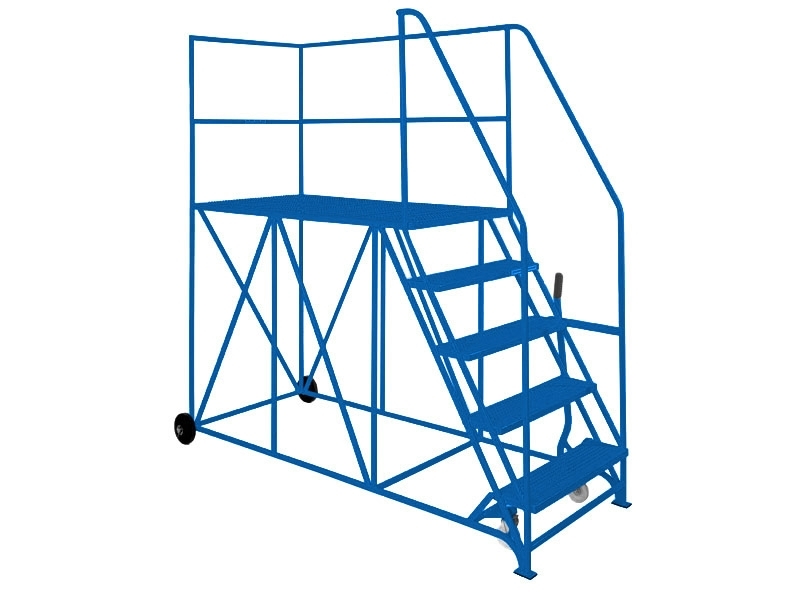 These portable steps provide support, stability and safety for workers during building renovations, warehouse inventory work, as well as stock inspection jobs. The platform of warehouse steps can vary in height and width depending on the requirements of the task. Where can a Access Platform be used? A Single Ended Access Platform is used in homes, commercial as well as industrial locations. 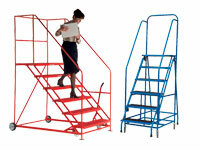 Mobile Safety Steps can be a vital equipment in storage facilities and warehouse operations. Likewise, the platform is utilised in parks, airports, concert venues and multi-purpose activity centres. Learning institutions as well as hospitals employ this elevated stand in many of their daily activities. Moreover, this evolution of the traditional ladder is an efficient support platform used in gymnasiums, malls and sports arena. Who might use this Mobile Access Ladder? Just like a normal step ladder, this product has a myriad of uses for many businesses. 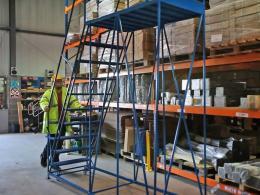 Most common among users of the access platforms are warehouse personnel who maintain large inventories in boxes stacked at different shelf levels. The platform enables these personnel to conduct their stock inspections with stability and without risk of accidents or damage to products. Building as well as home renovations crew such as painters, electricians, and carpenters make use of the platform while working on their assigned tasks. Maintenance staff in parks, airports, and sports centres utilises the elevated stage during repairs or preparation work. School assistants as well as members of the hospital workforce employ the platform while managing their materials stocked in their storage facilities. The Single Sided Work Platform is constructed of sturdy tubular steel and mounted on two fixed wheels and two swivel castors. 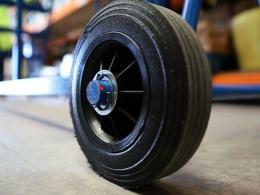 For safety, the treads and the platform are made of non-slip punched steel. On both sides of the steps and at one end of the single access platform are handrails. The opening access may either be on the right or left side of the platform depending on the user’s preference. The platform is mobilised or immobilised with a hand operated lever. Interesting facts about our Single Sided Work Platform A UK specialist lifting equipment testing and design company, which is also a member of the Lifting Equipment Engineers Association, has assessed the Single Sided Work Platform for load test in 2013. The platform was tested to a maximum load of 300kg evenly distributed, using calibrated test weights.